In this blog, you will see how to connect with Microsoft Flow using PowerShell. Microsoft has released a preview version of PowerShell cmdlets for PowerApps, which can also be used to manage your flows. 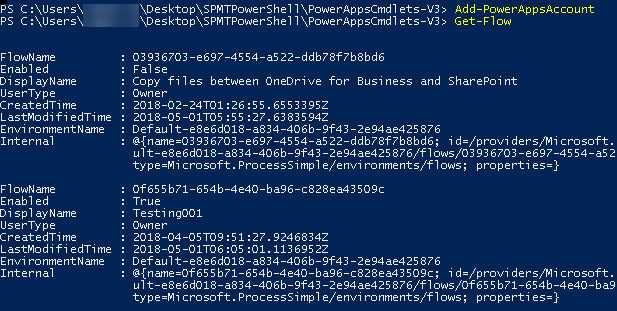 In this blog, you will see how to connect to Microsoft Flow using PowerShell to manage your flows. Download the PowerShell scripts file from here. Extract the zip files. Run the following command to import the modules. Run the following command to manually unblock the PowerShell files. Refer the known issue. Run the following command to connect. Enter the credentials in the login popup window. Run the following command to get all the Flows created or shared with you. Thus in this blog, you saw how to connect to Microsoft Flow using PowerShell.